When You Have To Sew Something Vintage . . . Fast! This past January we hosted a 1933 party at our house. I’m part of a small group that does . . . . well not exactly reenactment . . . and not exactly murder-mystery . . . events. Hard to describe really, except to compare it to a sort of live-action soap opera drama with supernatural overtones. And NO . . . this is NOT some vintage riff on “Twilight”. As you can guess, since we were hosting, I was so busy with preparations trying to get everything coordinated (caterer, music, etc.) and organized and ready, that I didn’t have much time for sewing. I needed at least one day dress (well ideally two) and one evening gown dinner dress. Weirdly enough I own five evening gowns that look 1930’s (two which are actually vintage), so I was able to slide on that one. And for one day I was also able to skate with a “faux-vintage” blouse and skirt. And of course . . . I was down to the wire with only a day to put something together. Can I see a show of hands of all of you who have been here before? Don’t let the “Size 20” alarm you. It’s a vintage sizing, and is actually equivalent to a 38 Inch Bust and 41 Inch Hip. I ended up using this size because it was fairly close to my hip and waist measure- ments, but I had to take it in at the bust. I’m a bit “pear-shaped” these days . . . sigh. But this looked like it would go together quick, and that was important, since I only had a couple of hours before I needed to wear it! 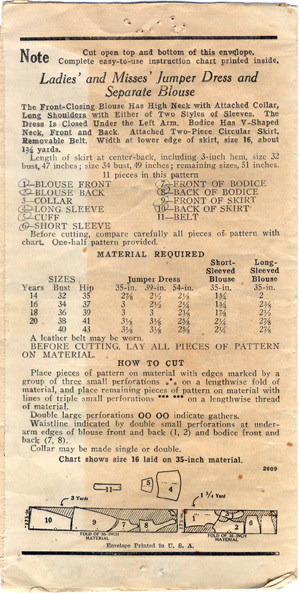 Looking through my fabric stash – I needed to find something that was 1930’s looking, and didn’t require a lot of finishing. So things like French seams, zippers and buttons were out, because I knew I wouldn’t have time to do all of the finishing techniques before I had to put it on. I found in my stash some light weight cotton fabric that had very art deco looking berries in dark blue and apple green. And surprisingly I also had some apple green boiled wool that matched the green in the cotton. 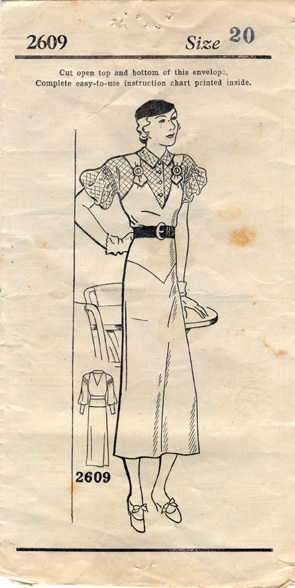 Granted boiled wool probably wouldn’t have been used for this dress – but the wool had the advantage of no raveling edges, so finishing would be minimal. 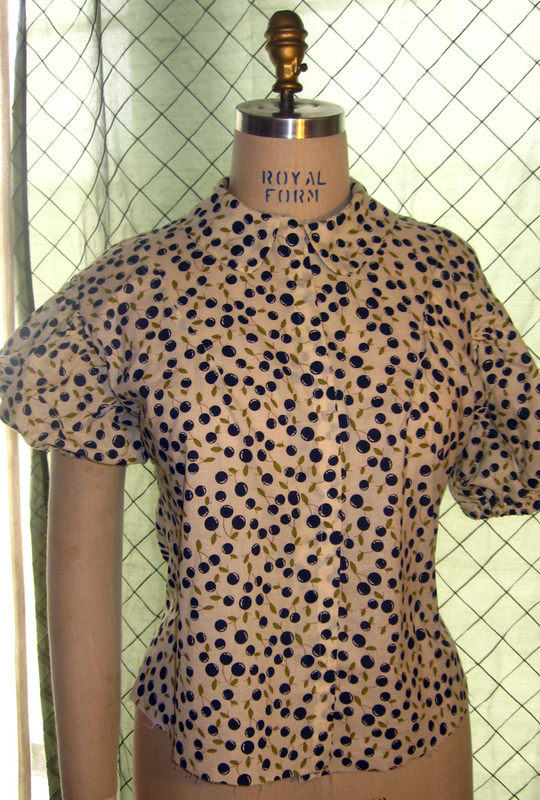 Here is a picture of the almost finished blouse. The drop shoulder puff sleeve is pretty cute, I think, with the double row of gathers at the shoulder. Because I was in a hurry to get it done, I just made two diagonally shaped darts in the front from the shoulder towards the center front. I sewed them on the right side, so they look like really long tucks. You can’t see them in the photo, because the pattern blends so well together. And when the jumper is worn over it, the straps hide them. Even so, I think this is a blouse that I’ll probably wear with jeans in the summer. When it’s warm enough not to have to wear three or four layers, like I’m doing now. I still need to hem it, put buttons or snaps on the front, and bind the seam on the inside neck to finish it up. Here’s the photo of the jumper with the blouse. The green originally looked to stark against the blouse, so I put an edging of the blouse fabric around the neckline and arm opening. The sliders on the straps are belt buckles, that I picked more for color – but they are actually a bit too heavy for the dress. I’m on the look out for something else to replace them with. And clearly – I didn’t get the belt made – so for the day that I wore it, I just tied off a strip of the blouse material as a sash. I still need to put some snaps or fastener bars under the straps, and to tack down the slider buckles to the fabric. I may take it in a bit more at the sides at some point. I finished the whole thing in about 6 hours of marathon sewing. And got lots of compliments on it at the party! OOHHH…I love this sooo much! The fabrics are fantastic and I’m just adoring the tabs at the front of the dress and the sleeve details! Hehe, I think I know what you were up to. I’ve just finished some Norse outfits for something similar! The outfit is lovely, I’m amazed you managed to run it up so quickly! Thanks for all of your kind words. I’m hoping to have the pattern available through the Library soon!